We combat natural disasters with acts of God. Disasters of incredible magnitude call for people of incredible generosity. Insured losses due to natural disasters total about $15 billion in the U.S. each year. Drought, wildfire, flash-flooding, hurricanes, tornadoes, earthquakes and blizzards are the greatest threats to our country. We give rest to the weary. While every disaster is unique, the core of our disaster program consists of several basic services. And while these services address many of the typical needs of a disaster survivor, Salvation Army disaster relief is also flexible. Our services are adapted to the specific needs of individuals and communities, and are scalable according to the magnitude of the disaster. The Salvation Army helps meet the needs of disaster survivors through a variety of programs. As one of the nation's major emergency relief organizations, The Salvation Army recognizes the critical importance of being prepared for natural and manmade disasters. Therefore, we take steps to ensure our own ability to respond quickly and efficiently to a disaster, while also working to educate other disaster professionals and the public at large about how to prepare for and respond to emergency situations. Emergency response services are activated on short notice according to an agreed-upon notification procedure coordinated with federal, state and local governments. Typically, Salvation Army personnel and resources will congregate at predetermined staging areas, entering the impacted area only once government first-responders have indicated that it is safe and constructive to do so. These immediate response activities include food and hydration services, shelter, cleanup and emergency communication assistance to put victims in touch with their loved ones. Depending on the magnitude of the disaster, The Salvation Army may continue providing immediate response services, such as emergency shelter and food service, well into the recovery process. Additionally, The Salvation Army will often coordinate with local, state and federal entities to develop and execute long-term strategic disaster recovery plans. These activities include restoration and rebuilding initiatives, disaster social services (to address essential living needs, medical expenses or funeral costs) and in-kind donation distribution to disaster victims. 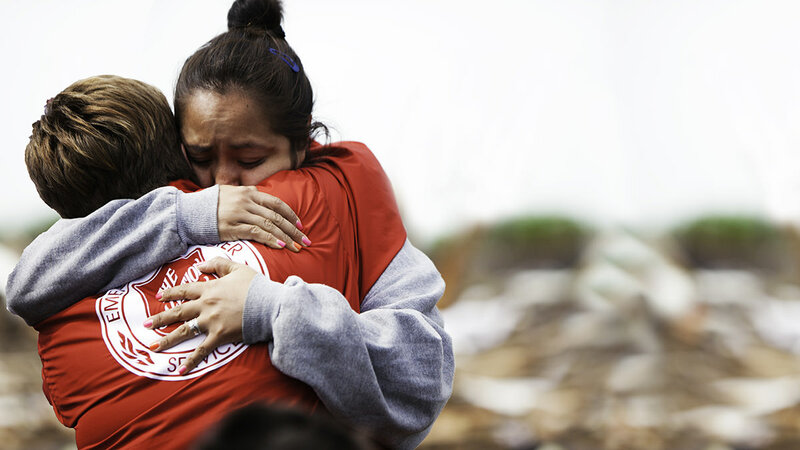 Throughout the duration and aftermath of a major disaster, The Salvation Army provides spiritual comfort and emotional support upon request to victims and emergency workers coping with the stress of a catastrophe. Salvation Army counselors, who are often ordained as clergy (officers), may simply offer a "ministry of presence," but often people who know about The Salvation Army as representatives of God may ask for prayer or help from the Bible. Disaster relief and recovery services are provided to all in need without discrimination.